FILE - President Ahmed Mohamed Silanyo stands to salute troops during a street parade to celebrate independence day for the breakaway Somaliland nation from Somalia in the capital, Hargeysa, May 18, 2015. 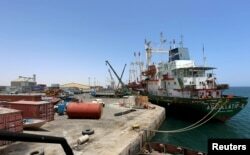 Officials in Somalia and breakaway Somaliland took bribes in exchange for authorizing a United Arab Emirates military base in the port city of Berbera, according to Somalia's auditor general. Auditor General Nur Jimale Farah is one of several observers questioning the propriety of the UAE base deal, which Somaliland's parliament overwhelmingly approved Sunday. He also questioned Somaliland's right to reach an agreement with the UAE. Somaliland considers itself independent from Somalia, but is not recognized by any country. “The deal has none of the legal provisions needed and did not go through Somalia's legitimate public procurement, financial institutions and the parliament. Therefore, it is corrupted and illegal,” Jimale said. “We know that individuals within the leadership of Somalia and Somaliland were invited to Dubai and that they were corrupted with bags full of cash to sign the agreement,” he added. Jimale would not specify the individuals allegedly involved in the deal, and VOA could not independently verify the allegations. Speaking to VOA on condition of anonymity because he was not authorized to comment on this issue, a senior official in Somalia's foreign ministry refused to deny or confirm the corruption allegations, but said neither the ministry nor the Somali cabinet was given a chance to discuss the UAE deal. Somali's former president Hassan Sheikh Mohamud is escorted as he leaves a meeting in Ethiopia's capital Addis Ababa, Jan. 30, 2017. Abdiwahab Abdisamad, an independent Nairobi-based Horn of Africa analyst, said he also heard the agreement got a secret green light from the outgoing Mohamud administration. “As the reliable sources we are getting from the ground indicate, before Somaliland, authorities within the administration of the former head of state Hassan Sheikh Mohamud signed the agreement and Somaliland put it into vote at its parliament, only to send a message that it is a Somaliland project rather than a Somalia project,” Abdisamad said. Somaliland's Wadani and OCID opposition parties have described the agreement as illegal and unconstitutional. A ship is docked at the Berbera port in Somalia, May 17, 2015. The agreement calls for the UAE to operate a base in Berbera for 25 years. Previously, Somaliland signed a deal with a UAE international port operator DP World. That deal would upgrade the port of Berbera, the largest in Somaliland. Being part of a coalition that has been fighting Houthi rebels in Yemen, the UAE already has a military facility at Eritrea's Assab port for use. The Berbera base, which is only 90 kilometers from the shores of Yemen, will help it tighten the coalition blockade on the rebels. Somali analysts say the base will be less of a headache for the UAE than the one in Eritrea, which is under United Nations sanctions. Speaking at the parliament session, Somaliland's President Ahmed Silanyo said that the military base would benefit Somaliland and help create jobs. In an interview with VOA on Monday, Somaliland Aviation Minister Farhan Adan Haybe said the deal has gone through all the Somaliland legal channels and therefore would be valid. “The base is on a lease. It can't be used by any other nation except the UAE, and can't be subleased.” Haybe told VOA. However, Jimale called on the UAE to back out of the deal, saying it violated Somalia's national and territorial integrity.